The release of Valve’s The Orange Box saw epic FPS title Half-Life 2 and its DLC — Half-Life 2: Episode 1 and Half-Life 2: Episode 2 — released on the same disc. Episode 2 ended with a cliffhanger that has left gamers anticipating the next episode for years, teasing that Gordon Freeman would have to find his way to the Borealis, a ship owned by Aperture Science. Portal 2 had a Borealis easter egg, but otherwise, Valve has been silent about what exactly is going on with the Half-Life franchise. 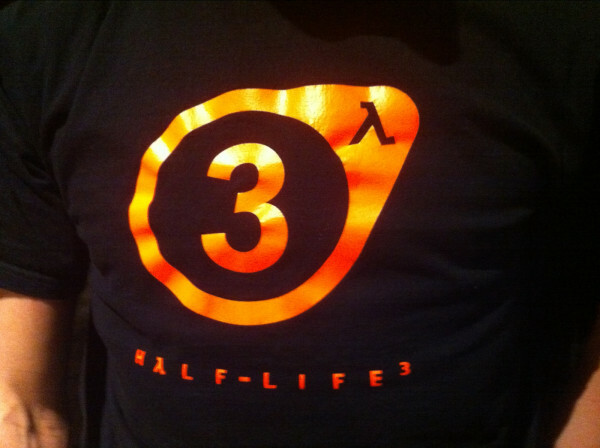 To make the wait even worse, a T-shirt of the Half-Life 3 logo has been spotted by on a Valve employee at a local game developer event. Valve has made no official announcements about the future of the Half-Life franchise and, while some may point to this being a game reveal, we have to agree with Ekanayake that it more likely that it is simply Valve trolling expectant gamers.